Having your own Symbiote might seem like a really awesome idea, but just take a look at everyone who has worn the suit. First, Spider-Man donned the Symbiote as a cool new way to show off a new look, but the Venom suit gave him some anger management issues, And sure, Eddie Brock enjoyed super strength after he bonded with Venom, but the Symbiote nearly drove the guy out of his mind after a while. Then, Mac Gargan bonded with Venom and he tried to eat people… literally. Now he’s bonded to Flash Thompson, who had his life thrown into the middle of plenty of dangerous situations since he starting wearing the Symbiote. We’re here to let you know that there is still a way to get that classic Venom look without having to attach a mood-altering alien to your body! 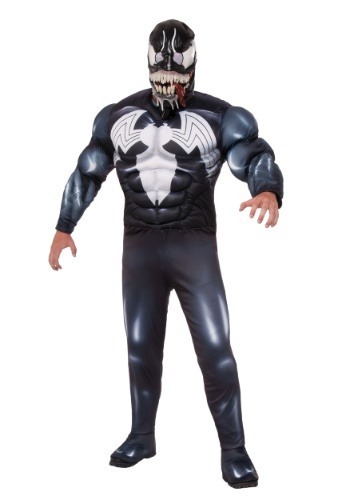 You can just wear this Deluxe Venom costume. It’s NOT made of any alien materials and was originated on the good old planet Earth. The costume comes with a muscle-chest jumpsuit that has the Venom spider emblem on the front. It also comes with a molded mask that’s shaped in the form of the Marvel villain’s face and, boy, is that mask detailed! It has details like his big nasty fangs and that long protruding tongue. It even has fake slobber (since we all know that Venom has some major salivation issues). Once you have this awesome Marvel costume on, you can terrorize Spider-Man in the streets of New York City, or you can go ahead and play the role of misunderstood vigilante. The choice is totally up to you!